This Barnes VOR-TX ammunition delivers incredible terminal performance against deer and other midsize game suitable for the .270 Winchester. Each cartridge in this box of 20 fires a 130 grain TSX bullet at a muzzle velocity of 3,060 feet per second. Barnes TSX bullets use a lead-free solid copper construction that delivers massive expansion and penetration. There's no jacket to separate from the core, so terminal performance is extremely reliable. TSX bullets also come with grooves cut into the sides to absorb expanding material as the round is fired. This keeps chamber pressures to a manageable level and makes higher-velocity loadings possible. 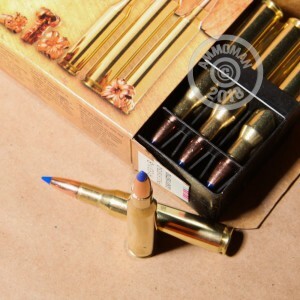 Barnes ammunition is made in Mona, Utah using non-corrosive Boxer primers and brass cases.